Its good to see that developers have started developing applications for Google Plus. 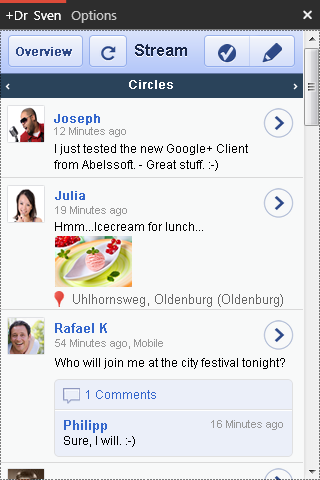 Abelssoft has developed a Google Plus desktop client for windows powered computer. GClient is a small application using which you can manage your Google Plus account from your desktop. You can perform all major tasks of Google+ without having to visit the website and that too from your desktop. It will display a handy window showing your latest Google+ activities. This window allows you to post messages and to follow the activity of your circles. Nothing much about me. I just love playing with gadgets and windows.